GUESS WHO IS PULLING UP AND STANDING BY HERSELF??? Yours truly, little Miss Ella Hope Carder. What a big girl! Today she figured it out and has been pulling up on EVERYTHING. We're so proud of her and this just shows us that she really has gotten so much stronger. We didn't know when she would start pulling up because her left arm is still weak and she has a hard time reaching up with it, which pulling up requires you to do. However, even though her range of motion is limited and her arm is weaker than her right, she is able to use it to help pull herself up. Yea Ella! It's so encouraging to see because we still have a long way to go as far as stretching and strengthening her muscles on that side. Time will tell what her range of motion will be in her left arm. Her shoulder deformity was very rare and her shoulder surgery was the first her surgeons had ever performed of it's kind so really none of us know what she'll be able to do or what kind of range she will have. We just know that she has made good progress so far and we're just continuing to pray that the Lord will heal and strengthen her arm and give her full range of motion. Another thing that has made it harder for Ella to stand on her own is her weak abdominal muscles. 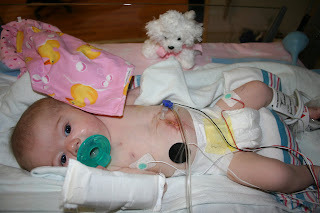 If you remember, her ab muscles are not closed because at her omphalocele repair surgery at birth it was such a tight fit getting the organs put back in that they were not able to pull her muscles together. It was just a skin closure so because of this she has a hernia which she will have surgery for to repair in the next several years. Anyway, because of all of that her ab muscles are weak so things like walking, pulling up and other things are harder and often delayed for babies like Ella. So, can you see why we are SOOO excited that she has reached this milestone?? She is a hard worker and is so cooperative in all of her therapies that she is in which is such a blessing. Please keep praying for her, the prayers are definitely being felt and answered. Keep praying this week that she tolerates her feedings and gains weight. The dietician came today and Ella gained about 2 ounces which is good but we were hoping for a bigger gain. At least she didn't lose so that is a step in the right direction. So this means that we will continue on with our schedule of six feedings a day and try to increase her volume daily. This whole feeding/weight gain thing is very complicated,micro-managed,overwhelming and hard to understand, I know, unless you have a child with feeding issues. So, please continue to pray for us as we try to figure all of this out with Ella and make decisions that will work for her and our family. We have a lot of great help medically with it all which is a huge blessing but feeding is a very overwhelming and slllloooowwww process. Slow meaning probably for several more years. I'm not trying to be Debbie Downer or appear as if I'm giving up hope, I'm just being realistic. So that's why sometimes it's hard for me to answer when I'm asked "How are feedings going?" or "How's Ella?" I mean, I don't know...she is doing well and we are definitely blessed, but things are not great or near being "normal." It's BETTER, but it's still hard and we have a long way to go. Please know that I love that people care and genuinely want to know how things are going and how to pray so don't take this at all to mean that I feel awkward or annoyed by the questions because I definitely appreciate and want them. I feel immensely blessed by such an amazing support system with friends and family who have and continue to help us so much and I don't take it for granted. You know me, I just can't sugar-coat things so hopefully without making others feel awkward by my response to their questions I try to be as honest as possible without going into great detail that no one really can understand anyway because they're not in my shoes. Does that make any sense? Hope so and sorry if it doesn't. It's just that with a child like Ella who has some special and specific needs you don't see big changes day to day so sometimes I feel like we've gotten nowhere and I'm banging my head against a wall with all of this but the truth is she has made great improvements, it's just baby steps when I want giant leaps. I'm learning to be thankful for baby steps and I just have to remind myself of where we started from. Last year on this day Ella had her G-button surgery and was still in the hospital so I would say we've come a long way wouldn't you? I mean, this past Saturday night at dinner the girl ate 1 1/2 french fries(a girl after my own heart :)), two slices of carrots and part of a mandarin orange slice. Seriously, let's get this child some fries and let 'er go to town! What a difference a year makes. Thank you Lord! Wow, this post is getting a little longer than I had planned. You get me going on this whole feeding and special needs children topic and I could talk for awhile. Get ready because there will be more where that I came from. I am definitely learning A LOT through our struggles with Ella and it has opened my eyes to this world that we are in along with so many other families of children that need extra special care. I don't feel alone in this thanks to our amazing families, friends and support system. I feel different, but not alone. Thank you Lord for being faithful to us! Keep praying, love to all! This past weekend we had a fun time going to a little pumpkin patch by our house and then to a Halloween party. It was so fun because we actually got to do these things as a family. I know that sounds weird but really we rarely go anywhere besides church or maybe to the park as a family. It's just been too difficult with Ella's feeding schedule to be able to do much without sacrificing a feeding or getting off schedule. That sounds a bit rigid and we're not trying to be but when you have several appointments every day and Ella has to be fed so often we have to stay on schedule in order to work in all of her appointments and keep feedings on track. So micro-managed I know, but that's just our life! So anyway, that's why weekends like this past one where we got to do some things outside of our house as a family are so fun and we actually feel semi-normal. On a side note, this weekend was different because we dropped one of Ella's feedings so she's down to six feedings a day instead of seven. So if you saw us out and about more this past weekend, this is why. It's not that things have miraculously gotten better all of sudden, we just dropped a feeding so we had more time to actually leave the house and not have to rush back to feed Ella. This feeding schedule is huge because it gives us SO much more flexibility with feedings and time during the day to do things such as going to the pumpkin patch. It was so nice to have more time in between feedings and to actually let Ella take a long nap and not wake her up to eat. I think this weekend was the first time in her life she was able to take a long afternoon nap without having to be woken up to be fed. Poor thing. This past weekend was a trial run with the whole six feedings thing and the dietician came today and weighed her and she had lost some weight. :( Boo. But, we decided we're going to give it another week doing six feedings and we're going to bump up the volume a little in each of her feeds in hopes that we can continue with this schedule and she'll still gain weight. We'll see next week when the dietician comes back to weigh her. Seriously, be praying that this will work and that she will gain weight. I'm not kidding, y'all pray!! Anyway, back to the weekend, we went to a little pumpkin patch to try to get some pictures of the girls which was fun but a little wheels off. It was sooooo muddy and the only place to take pictures you had to stare into the blinding sun so the pictures didn't turn out quite as good as I had hoped. Classic. We all looked like we were in pain because our faces were all scrunched up from trying to do the awkward blinding-sun-smile-but-trying-to-smile-normal thing. You know. I didn't post any of those because they're just rough. Maybe I should though just for kicks. Anyway, needless to say, we didn't stay long and we were just a taaaddd bit muddy. Oh well, a little mud never hurt nobody...shoot. The next day we went to our friend's annual Halloween party and trick or treating. We had a great time and it was Ella's first "official" Halloween since last year at this time she was still in the hospital. We didn't do any partying then either because we were up at the hospital visiting her. Her sweet friends in the NICU made sure she was all festive in her ghost onesie though for us when we came to visit. Last year at this time, sweet baby girl! Unbelievable how she's changed. We had great time dressing the girls up this year and visiting with friends. Ella was a nurse and Eva was an M&M. Appropriate don't you think? Sweet Eva, the girl loves candy so being an M&M is just right up her alley. Don't you love that her hands look a little like Edward Scissorhands? These gloves were the best I could find so we just went with it. Aren't these shoes "heelarious?" Seriously, that's what they're called, I'm not that clever people. The crazy nurse will not sit still for a picture and look at her face...she totally knows she's being difficult and is thoroughly enjoying herself. Wonderful. Guess what we are? Isn't it obvious? Yes, I am the Octomom and Rick is the paparazzi. Can't you totally tell? :) That's what you were going to guess right?Well, this was a last minute costume (if you can call it that) and bottom line is I am too cheap to pay for a black wig and I lost my sunglasses 30 minutes before the party so the only accessory to my costume was Ella's carseat filled with 8 of Eva's baby dolls. As for Rick, obviously this picture was taken with our camera which was his main costume accessory so this is what you're left with...Rick and Amy dressed as ourselves but really supposed to be the Octomom and the paparazzi. Hey, at least we tried right? All in all we had a fun weekend being a family and getting to spend some time with friends. It's okay Eva, yo Mama ain't skeered of a little pinata. Dude, I should've had a permanent pinata up in my backyard this past year. I could've switched back and forth between hitting that thing around and throwing my plates. It's not too late, maybe I'll look into that. Aaahhh, very therapeutic. I think I have a new found love for pinatas. Isn't this so sweet? I just love this picture! Precious. Pray for good feedings and weight gain this week for little Ella! !